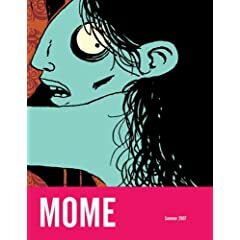 When it comes to comics anthologies, Mome always stands out. I've been reading the series since Fantagraphics released the first volume, and volume 8 continues the series' tradition of quality stries drawn beautifully. Beinga relative newcomer to graphic novels and comics, I always appreciate the opportunity to sample several new cartoonists. In this issue, the artwork of newcomer Ray Fenwick would alone make the book worthwhile, and "10,000 Years" by Tom Kaczynski is a wonderfully quirky science fiction tale from a masterful storyteller and cartoonist. My next book is the Chris Nieratko's memoir, Skinema.